Researchers based at the German Research Center for Artificial Intelligence (DFKI) have been busy lately, judging by their latest glut of futuristic video content. Seemingly out of nowhere, the Center dropped no less than 34 YouTube clips on Tuesday, showcasing some of its most cutting-edge work, from human exoskeletons to Mars rovers to robotic praying mantises. We parsed some of the coolest concepts and platforms DFKI included in its latest upload frenzy into this list; it’s an intriguing window into the one of the largest AI research organizations in the world. This robot, located in Germany, is being controlled remotely by a researcher wearing the DFKI-developed AILA/CAPIO exoskeleton in the city of Magnitogorsk, Russia. Researchers hope to use the 30-pound suit and teleoperated humanoid to replace human operations in dangerous environments, like the fallout of a natural disaster or outer space. With its rotating wheel axles and ability to dock with other cars to save energy, the EO Smart Connecting Car is the kind of vehicle you’d expect to show up in a hyper-efficient scifi utopia. It might be a good car for people who struggle with parking, but it’s hard to picture this highway riff on a conga line functioning in practice. What if someone in the middle suddenly needs to change lanes? 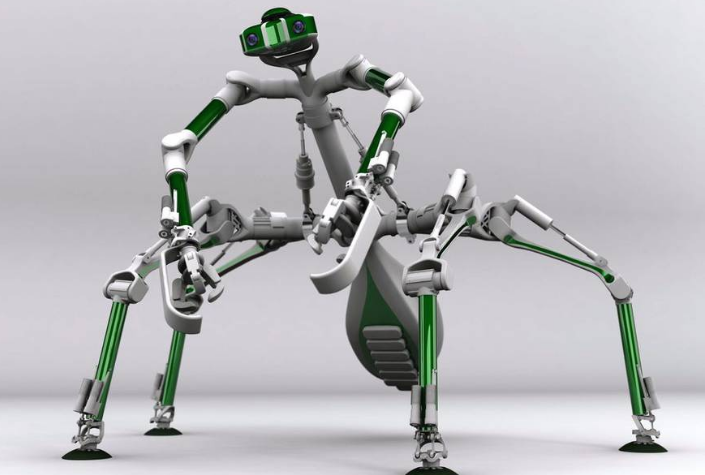 DFKI’s LIMES experiment, which stands for Learning Intelligent Motions for Kinematically Complex Robots for Exploration in Space, is a mantis-inspired robot design intended for extraterrestrial exploration. “In future extraterrestrial missions, such a system will allow taking soil samples from difficult-to-access regions or assembling and maintaining infrastructure on rough and unstructured surfaces of celestial bodies,” the project team said. Last but not least, bear witness to the test flight of the Center’s StarTiger terrestrial landing system, complete with an epic score. Developed with the European Space Agency (ESA), this touchdown sequence is similar to the Sky Crane mechanism used to land NASA’s Curiosity rover on Mars, only in miniature. In light of the recent crashof the European/Russian Mars lander Schiaparelli, it’s comforting to know that the next generation of ESA planetary landing systems are already in development.